Have you purchased an expensive and stylish vaping set-up and high-quality e-liquid? If you have, then you need to know more about how to vape freely, whenever and wherever you want. It isn’t tobacco, but that doesn’t mean you can use it anywhere. There are few unspoken rules and etiquettes which you should know to behave properly when you are vaping in public, not just to mention that there is a shift towards some legislation. In case you are new to vaping and ecig, or you are a seasoned vaper, you can certainly use some of the best etiquettes. After all, it is more about being polite and the way you actually behave in the public that further impacts you in the future. Vaping is quite new, and the most conspicuous aspects of it are things like sub ohm vaping and cloud chasing which has become quite popular in recent years. There are laws which restrict vaping which are emerging and there is quite some potential for vaping to be legislated as harshly as it is done with smoking. As a person, you can help in shifting these legislations in your favour by means of behaving properly and responsibly showing that vaping is not only healthier but also different than smoking, such that it can certainly be accepted by the general public. Along with this, there is the matter of good manners. The main advice which we mention is the basic decency as well as a right code of conduct to be implemented to present vaping as a quite harmless habit rather than being an obnoxious vice. When it comes to the location of vaping, you should know the basic etiquettes related to different places. Let’s have a look at those. Home- When you are in the privacy of your home, you need to set your own rules. Different than tobacco, vaping doesn’t stain any fixtures of fittings and doesn’t even have the smell which lingers on for a long time, so if you wish to have an evening blowing clouds, then feel free to do so. In case any guests are coming to your home, it is polite to air the room out before they actually arrive and also ensure that they are fine with the fact that you are vaping right in front of them. You should remember that a lot of people don’t know about what vaping exactly is or how it works, so you need to set them at ease. Driving- Recently, the UK and other countries have passed a law banning smoking while driving a car. Though vaping while driving a car is technically legal, vapers could receive fines and disqualification. A car which is filled with thick vapour actually impairs the visibility that makes it a danger for everyone on the road. Also, there is another safety risk which is the faint reside that is left on the windscreen when you are using high VG fluid. Overall, it is being recommended that you should avoid vaping when you are driving or even when you are in the passenger seat to prevent any type of confrontation with the law enforcement. Outside- In case you are outside your home like hiking in a different country with a clear day and nobody around, then you can vape. However, if you are walking down on any busy street or waiting for a taxi, then you should be aware of the people that are near you. You might like the vape blend, but it doesn’t mean that the general public will want to smell the second-hand vapour. Remain conscientious and consider few steps so that wind doesn’t blow the vapour into the people. Private Business- It is a tricky part. In case you are at a cinema or a concept, then vaping is certainly not recommended. Vapours essentially hinder the visibility, and in case you are close to people, they might object the smell. Whether it is shops, clubs or bars, the behaviour of the people vary, and it largely depends on the different rules of that particular country or the state. If vaping isn’t banned in the place, then ask the member of the staff. If you are allowed to vape, then be responsible for it. Always below the vapour away from the people or on the floor. In the case of restaurants, the matter is even more delicate. You have to make sure that it is acceptable to both the staff as well as the fellow dinners. It is better to step outside if you want to vape. Public Transport- Trains, buses and planes are now starting to restrict vaping. If it isn’t banned, then it is probable that at least one person who is on-board might object to your second-hand vapour. It isn’t the place only which matters. You should also consider how exactly to behave around the people near you. Here are few of the pointers. Children and Pets- You will never smoke cigarettes around any kid so you shouldn’t vape either. The main goal is to set a good example. The PG content related to electronic cigarette and vaping can essentially have a negative impact on your pets like cats and dogs which can lead to anaemia. Avoid vaping near your pets. Also never leave the vaping equipment unattended around the pets and the children. Most of the non-smokers wouldn’t mind if you are vaping around them, but it is better to check first. 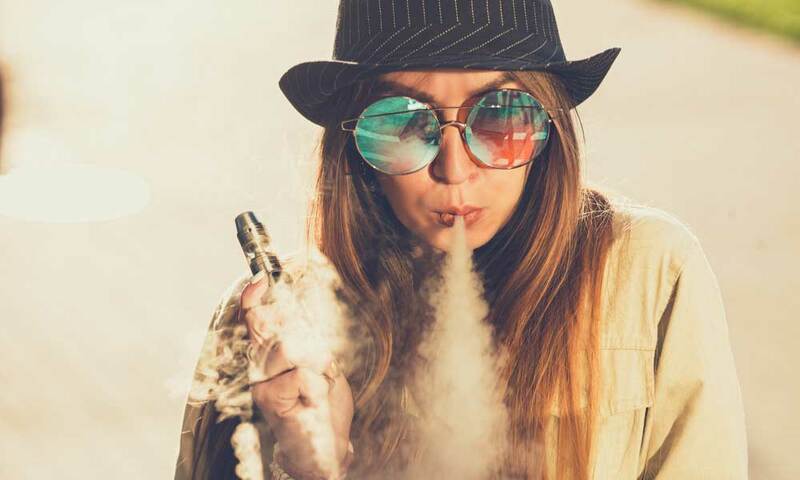 There is certainly a lot of wrong information out there even though studies have concluded that second-hand vapour is safe, but not everyone knows about this fact. Smokers- Never criticize smokers. Many of us have been in their position once. In case they show any interest, then let them know about the benefits of vaping but make sure that you are not being condescending. It all comes down to the basic etiquettes and manners. Studies have successfully proven that there isn’t any potential risk from second-hand vapour, but you should remember the fact that people don’t like to breathe the vapour, in general. If possible, try to educate the people while being brief as no one likes to get preached. All it takes is to ask the people around you if they mind. In case they do, then respect their wishes. It is a sensitive time for vapers around the world with many states and countries looking to bring restrictive laws. If you build a reputation of courtesy, it can certainly help.